About Hotel: 8-Story, Interior Corridors, Parking (fee), No Pets Allowed, Fitness Room, Pool, Beverage Area (Complimentary), Breakfast Area (Complimentary), Coin Laundry, Elevators, Gift Shop, Wireless HSIA in guest rooms, Television, Air Conditioning, Black-Out Curtains, Bolster Pillow, Clock Radio w/ MP3 Connection, Connecting Rooms, Curved Shower Rod, Seating Area with Sofa, Sofa Bed, Spacious Two Room suite, Hairdryer, High Speed Internet Access, Iron/Ironing Board, Kitchenette, Microwave, Mini Refrigerator, Newspaper M-F (USA Today). Railroad View: Excellent view! Upper floors (front of building) are necessary for a railroad view. Railroads past Hotel: CSX / Amtrak / Virginia Railway Express (commuter railroad) / NS (daily local) / Washington METRO Transit (every 2 minutes). Expect about 53 passenger trains during a 24-hour period, and about 15-20 freights a day. There are no passenger trains over night, the railroad gets quiet between 8pm and 5am, some freights may appear, but more pass during the daylight. Railroad Radio Frequencies: 161.550 (used by CSX, Amtrak and VRE past motel). Keep your radio tuned to this channel while in hotel. All crews call signals, a hot box detector just north of hotel located at MP 106.4 gives you a great heads up of approaching trains. Other radio channels used in the area are: 160.950 (NS yard, south of town), 160.410 (CSX Baltimore Dispacther). 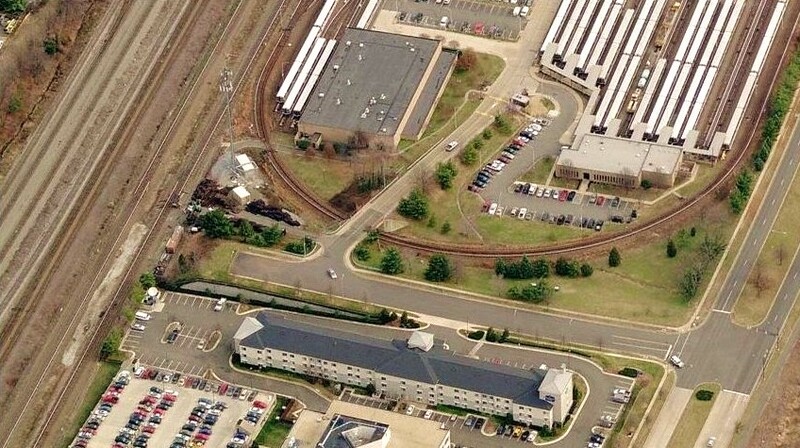 Comments: The Alexandria train station is across the street / tracks from hotel. The station is a popular railfan hangout. When in the area, be sure to visit Long Bridge Park in Arlington, VA. Long Bridge Park was built with the railfan in mind. The park has elevated walkway along the same busy rail line is a great place to spend the afternoon watching trains. The view from the open area in the park is great for watching passing trains. Photo Comments: Embasy suites is the building to the top left of the picture. Its located across the street from the Alexandria Amtrak / VRE station, as well as METRO's King Street Station. A clear view of all the railroad action can be seen perfectly from any room on the front side of the hotel. Higher floor rooms are better for the view. 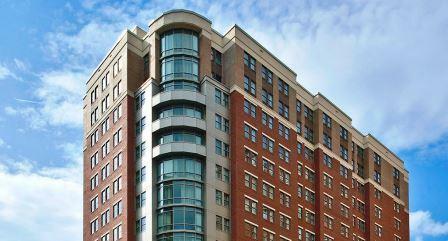 Within walking distance of Amtrak's Alexandria, VA train station and METRO's King Street Station. Location/ Directions: I-95, exit 177B to US-1 North. Turn left onto King Street and the hotel will be on the right side. 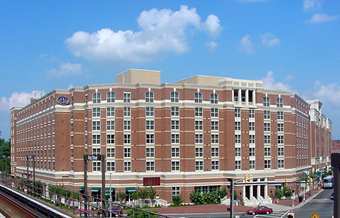 Located at the King Street Metro, 2 Stops from Reagan Airport and Steps from AMTRAK / VRE station. Railroad View: Excellent View! You need a room on the 5th, 6th, or 7th floors on the railroad side of the building for a perfect view of the railroad. These rooms will offer the best railroad view: 5th Floor= 516,518,520,522,524,526. 6th Floor= 616,618,620,622,624,626. 7th Floor= 716,718,720,722,724,726. Any other floor or rooms will not be as ideal. I had room 616 which consisted of 2-double beds, it was a great view. At night, you can not see train's very well, not enough light to read locomotive numbers. Railroads past Hotel: CSX / Amtrak / Virginia Railway Express (commuter railroad) / NS (daily local) / Washington METRO Transit (every 2-3 minutes on avg). Expect about 53 passenger trains during a 24-hour period, and about 15-20 freights a day. There are no passenger trains overnight, the railroad gets quiet between 8pm and 5am, some freights will appear overnight but more pass during the daylight. During my stay only 4 freight trains passed between 9:30pm and 5:30am (of coarse, I may have slept through some). Railroad Radio Frequencies: 161.550 (used by CSX, Amtrak and VRE past motel). Keep your radio tuned to this channel while in hotel. All crews call signals, a hot box detector just north of hotel located at MP 106.4 gives you a great heads up of approaching trains. I didn't miss any trains during my visit. Other radio channels used in the area are: 160.950 (NS yard, south of town), 160.410 (CSX Baltimore Dispacther). Comments: As far as a railroad view from a hotel in Alexandria goes, this is tops! Hotel is about 30-feet from tracks. No obstructions. The Alexandria train station is a 3-minute walk from the hotel . The station is a popular railfan hangout. When in the area, be sure to visit Long Bridge Park in Arlington, VA. Long Bridge Park was built with the railfan in mind. The park has elevated walkway along the same busy rail line is a great place to spend the afternoon watching trains. The view from the open area in the park is great for watching passing trains. Photo Comments: (Aerial Photo) West side rooms are flush against the tracks, these are the rooms needed for an excellent railroad view. South side rooms will have the Metro station canopy blocking part of the actual railroad view. As you can see, it's a walk across the street from to Metro's King Street Station. (Above Photo's) The four pictures are examples of the trains you can see from rooms mentioned above, such as room # 618 where these were taken from. 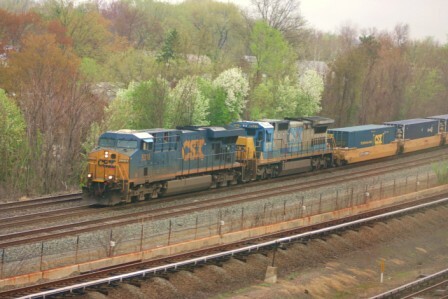 CSX freights, Amtrak passenger, and VRE commuter trains as well as the continuous parade of METRO Transit trains can keep any rail buff busy. About Hotel: 9-Floors, 200-Rooms, Interior Corridors, Multiple flat screen TV's, stereo and DVD players with movies available for checkout, Complimentary wireless internet is available is guest rooms, Daily housekeeping is available upon request (fee), Room service available 24/7, Laundry facilities, Parking garage (fee), Indoor swimming pools, Fitness center, Game room. Railroad View: Expect an Excellent view. Any room on the railroad side of the motel should give you a perfect view. This hotel offers one of the best railroad views in Alexandria. Too bad its tied into timeshares. Upper floors are better for a view. Railroads past Hotel: CSX / Amtrak / Virginia Railway Express (commuter railroad) / NS (daily local) / Washington METRO Transit (every 2-3 minutes on avg). Expect about 53 passenger trains during a 24-hour period, and about 15-20 freights a day. There are no passenger trains overnight, the railroad gets quiet between 8pm and 5am, some freights will appear overnight but more pass during the daylight. Comments: We have not yet rated / reviewed this hotel. This property is tied into Wyndham Time Share. If you are a time share owner, enjoy. Non-Time Share owners may have trouble getting a room. Those who do get a room, expect to have time share sales people bother you during your stay here. Internet reviews will give you details. 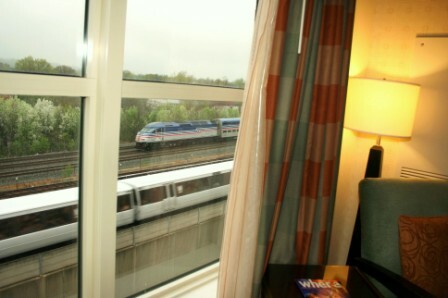 Photo Comments: Providing one of the best hotel-railroad views in Alexandria, the Wyndham Hotel along with the Hilton are located along side the CSX/Amtrak/VRE line which captures all the trains southbound out of Washington's Union Station. The Wyndham is the building with the curve to it, left side. The building connect to the top right is the Hilton Hotel. The Wyndham has an absolute clear view, where as the Hilton has many rooms that will be blocked with the station canopy, blocking a clear view of most trains. Location/ Directions: From I-95 North, take Exit 174/Eisenhower Avenue Connector, turn right at traffic light. Go to the second traffic light and turn left onto Blue Stone Road. Homestead is on the left. About Hotel: 3-Floors, 130-Rooms, Interior Corridors, Kitchen with refrigerator, microwave, and stove-top, Dining and cooking utensils provided, Convenient workspace, Wireless Internet (fee), Personalized voice mail, Iron and full size ironing board, On-site guest laundry, Pet Friendly Rooms. Railroad View: Fair to Good angled view. Railroad is next to the motel. No rooms face the railroad directly. Due to tree's, 3rd floor will be the best chance for a view. Get a room on the east side of the building (front side), high floors on the north end of the building for the best railroad view. The West Balloon track (west loop) of the Metro Transit shop / yard is near the front of the motel. 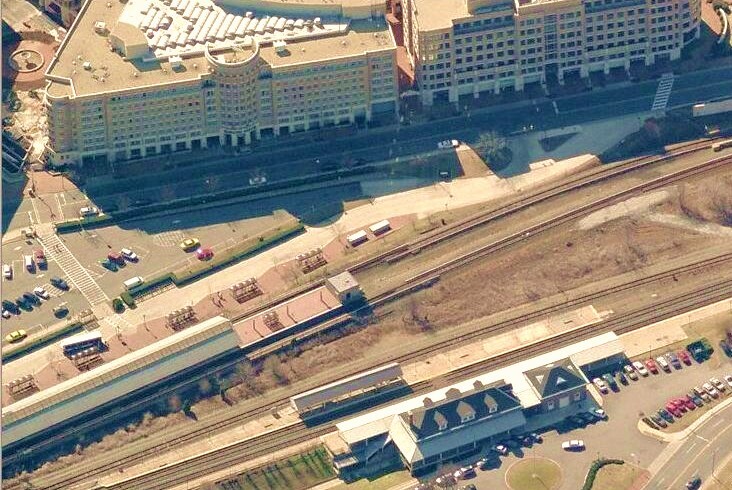 Railroads past Hotel: CSX / NS / Amtrak / Virginia Railway Express (commuter railroad)/ Washington METRO Transit. Comments: We have not yet rated / reviewed this hotel. Photo Comments: It may look like a model train layout, especially sticking a motel wedged near a bunch of railroad tracks, but this is real! The Homestead Suites is the gray building at the bottom of the photo. We are looking at the back side of the motel.. The front faces the METRO lay-up yard. To the left is the railroad lines of CSX/ Norfolk Southern / Amtrak / and Virginia Railway Express. Location/ Directions: I-95, Exit 176B Alexandria. Merge onto 236 East which will become Duke Street. Turn right at Dulany Street. Then take the first right onto Jamieson Avenue. Turn right at Andrews Lane. The hotel is on the left. 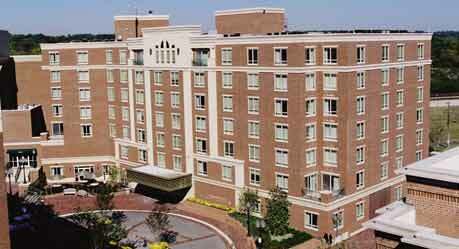 About Hotel: 8-Floors, Interior Corridors, Residence Inn Old Town Alexandria So. at Carlyle is an all-suite property w/ full kitchen and offers free hot breakfast buffet daily, the new Residence Inn Mix Lite Bite menu Monday through Wednesday nights from 6:00pm to 7:30pm. Enjoy the feeling of community as you enjoy our renovated lobby and new Lobby Bar! Stay connected with our free high speed internet and stay fit in our 24 hour accessible fitness center. The hotel is 3 blks from the Yellow line Metro and 6 blks the King St Metro (Blue line) where one may take the free trolley to go up & down King St. Old Town Alexandria, VA as well as be in DC within 30 minutes. Enjoy numerous dining, shopping, entertainment and places of interest - all within walking distance. The hotel also offers complimentary local shuttle service within a 2 mile radius. Located 2 blocks from the US Patent & Trade & US Federal Courthouse, 5 minutes from National Harbor and Tanger's Outlet Mall accross Wilson Bridge, it is perfect for both business and pleasure visits. Railroad View: Excellent view! Rooms on rear of building (south side) are needed for a railroad view. Upper floors are best for the CSX/NS/Amtrak/VRE lines, otherwise lower floors will only view the Washington Metro transit trains. 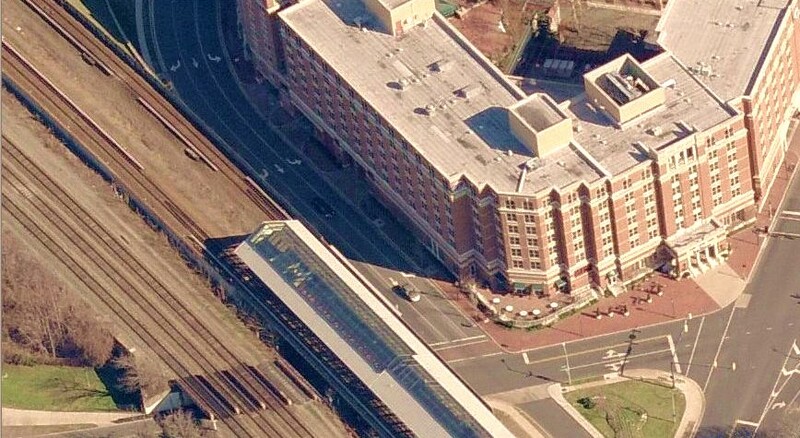 Railroads past Hotel: CSX / Amtrak / Virginia Railway Express (commuter railroad) / NS (daily local) / Washington METRO Transit. Expect about 53 passenger trains during a 24-hour period, and about 15-20 freights a day. Metro trains are seen from the hotel almost constantly. Railroad Radio Frequencies: 161.550 (used by CSX, Amtrak and VRE past motel). Keep your radio tuned to this channel while in hotel. All crews call signals, a hot box detector north of hotel located at MP 106.4 gives you a great heads up of approaching trains. Other radio channels used in the area are: 160.950 (NS yard, south of town), 160.410 (CSX Baltimore Dispacther). Comments: The Alexandria train station is a popular railfan hangout. 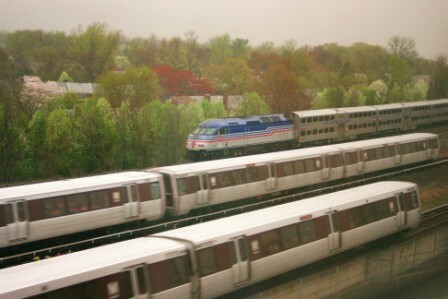 When in the area, be sure to visit Long Bridge Park in Arlington, VA. Long Bridge Park was built with the railfan in mind. The park has elevated walkway along the same busy rail line is a great place to spend the afternoon watching trains. The view from the open area in the park is great for watching passing trains. Photo Comments: The aerial photo shows the hotel circled in yellow with what looks like a busy model railroad. 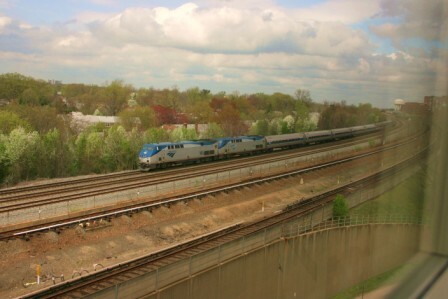 While several rail lines can be seen from the hotel, the heavy rail (Amtrak, VRE, CSX, NS) is seen along the bottom of the photo, these trains will be the furthest from the hotel. A good zoom lens or binoculars will be best to view these passing trains.